"I'm working on a polymer clay jewelry project in pink, magenta, purple and black, which is a stretch for me because I prefer desaturated earth tones. It'll consist of image transfers from magazine clippings combined with custom colors. 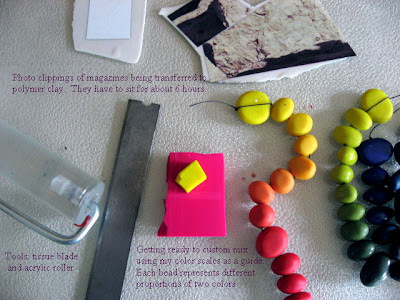 The colorful strings of beads on the right are color scales that help me get the proportions right when color mixing." Tune in next week for another Workspace Wendnesday with Boston Handmade!